That they may bind the moss in leafy nets." Since before the time that Lewis and Clark blazed their trail through the northwest territory, wildflowers have heralded the first signs of an earth that is warming, softening to allow sowing and reaping of crops and the return of wildlife to the wilderness and the vast plains. The 85-mile long Columbia River Gorge, running up to 4,000 feet deep, was carved by ice age floods, creating diverse soil and rock beds suitable for more than 800 species of native wildflowers and shrubs to prosper. Several indigenous species, found nowhere else in the world, grace the steep gorge walls, vast meadows and high plateaus. As the Columbia River cuts through the Cascade Mountains, two distinct climate ranges are formed…dry and arid on the eastern side, wet and densely forested on the western side. Many tributaries were cut off high above the gorge floor during the geological evolution of the area, forming the largest concentration of waterfalls in North America. Why not begin your journey into the magnificent world of wildflowers at one of those waterfall areas in the western part of the gorge, Horsetail Falls/Oneonta Creek. An average annual precipitation of 75 inches at Oneonta Gorge yields a temperate rain forest teeming with endemic and exotic species. In this rare ecological niche, at least 25 species normally found at 4,000-foot elevations can be found growing just 100 feet above sea level. All six indigenous species that are found only on basalt cliffs or near waterfalls in the gorge can be found along the trails in this area. Keep your eyes open for the stunning and dramatic Columbia Gorge Daisies and Oregon Sullivantia. This loop is 2.7 miles round-trip with about 500 feet elevation gain. 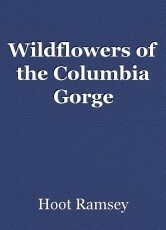 It can be accessed from The Historic Columbia River Highway near Multnoma Falls. Wear shoes that you don't mind getting wet…the creek can be very inviting on a July day when the proliferation of wildflowers is strutting its stuff. Traveling eastward from Oneonta, you will enter the transition zone, where the damp western end of the gorge and the drier eastern side meet in the central gorge. Here, the greatest variety and abundance of flowers can be seen at two prime wildflower-viewing sites with easy walking trails of three miles or less. Named for Oregon's late conservationist governor, Thomas Lawson McCall, and managed by The Nature Conservancy, the Tom McCall Nature Preserve is located just east of Hood River on the Oregon side of the Columbia River. From Portland, head east on I-84 about 65 miles. Take Exit 69/Mosier and turn right onto US 30 (Historic Columbia River Highway). Continue uphill for 6.5 miles to the parking areas at the Rowena Crest Viewpoint and the trailheads. The trail starting on the north side of the road goes through a flat plateau covered in wildflowers and dotted with seasonal pools. Beware of sheer cliffs along the edge of the plateau, especially if you are hiking with children. The trail on the south side of the road leads uphill for about 3 miles, passing through fields of flowers and stands of oaks and Ponderosa pines. Looking back, the hiker is awarded with a spectacular vista…ribbons of bright blue, yellow, red, purple, lavender and pink flowers stretching towards the river, the surrounding cliff formations and uplifting Mt. Adams in Washington. Poison oak, ticks and rattlesnakes also inhabit the area, so be sure to stay on the trails and wear long pants. Horses and dogs are not allowed in the preserve. Along with more than 200 plant species that thrive on this arid plateau, the open grasslands are home to four plant species unique to the Columbia River Gorge: Thompson's Broadleaf Lupine, Columbia Desert Parsley, Thompson's Waterleaf, and Hood River Milkvetch. In March, the prevalent flowers are Grass Widows and Yellow Bells. 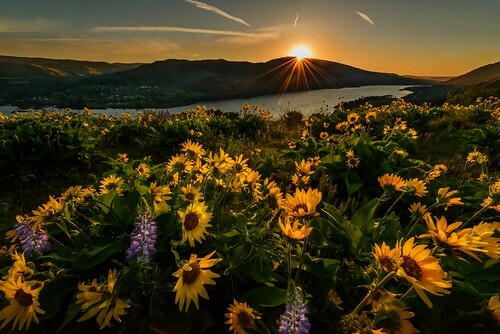 By late April, those will have given way to a spectacular display of Columbia Gorge Lupine, Prairie stars, Shooting stars, Northwest Balsamroot, Indian Paintbrush and Upland Larkspur. In addition to these, you can find white-and-blue Bicolored Cluster Lilies near the western edge of the plateau. Toward the northern edge of the plateau, when the trail passes through a rocky soil area you may also see orange Fiddleneck. Moving along to a pristine part of the Gifford Pinchot National Forest, you will find Catherine Creek on the Washington side of the Gorge, about 60 miles east of Portland. It is reached by following Interstate 84 from Portland to Exit 64 at the town of Hood River. Turn left and cross the toll bridge (75 cents) toward White Salmon, WA. Turn right onto WA Highway 14 and travel about 5.8 miles to Old Highway 8 and turn left. Another 1.4 miles brings you to the parking area. From here, trails lead along easy hikes through fields of flowers including Grass Widows, Camas, Poet's Shooting Star, Upland Larkspur, Yellow Bells and several varieties of the parsley family indigenous to these parts. The north side of the road rises in a gentle slope with a trail following the creek. On the south side of the road, a short trail leads through damper flower habitat, tiny seasonal pools and a small waterfall dotted with brilliant colorful blooms beginning in early spring. The peak season for blooming here runs from late March to late June. While you are in the Gifford Pinchot National Forest, skip over to Trout Lake and head up the 82 Road about fourteen miles to check out Bird Creek Meadows for one of the most splendid displays of wildflowers in Washington. You will find them everywhere—in rocky gardens, in boggy wetlands near the streams, and near cascading waterfalls. Paintbrush, Monkeyflower, Penstemon, Pearly Everlasting, Yarrow, Larkspur, Lupine, and a multitude of other blooms cover the meadows with a profusion of color. The wildflower loop (2.5 to 5.75 miles) can be done easily in a day, but camping overnight allows for more leisurely meandering through the meadows. Since this venue is on the Yakama Indian Reservation, a permit is required. The Yakama Nation permit system is available on site in season. The cost is $5.00 for one day's use. The U. S. Forest Service takes every precaution to see that botanical habitats are nurtured and properly managed. Picking of the flowers in any venue is strictly prohibited. Almost all wildflowers are fragile and many wilt and perish soon after being picked. Over the years, the repercussions of wildflower picking by unthinking people go far beyond the loss of the flowers themselves. A critical chain of events is triggered for years to come once wildflowers are lost. We don’t often realize it, but wildflowers support entire ecosystems for pollinators, birds, and small animals on a micro scale. Butterflies and other insects, small birds, and animals depend on seeds, nectar, and pollen for their food supply and life support system. In addition, some pollinators are not very mobile or have very small home ranges or depend on just one species of plant and die once their habitat has been destroyed. We, as individuals, are the stewards of the bounty of flora and fauna that nature has brought to our universe. The cardinal rule of the trail is "leave no trace...only your footprints." Live by it, so that others may enjoy the sites long after your day in the meadow has passed. © Copyright 2019 Hoot Ramsey. All rights reserved.